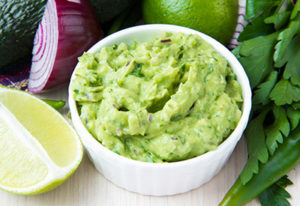 4 Ingredient Classic Guacamole Recipe - A Healthy Snack! 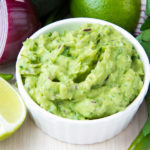 Almost every guacamole recipe that you find on the internet adds tomatoes and various spices that you may or may not have on hand. It’s time to get back to the basics and make classic guacamole that everyone will love! The perfect guacamole recipe that has only 4 ingredients and is healthy and delicious! I had never been a fan of guacamole growing up. I think it was more due to the color and texture than the taste. In fact, I wouldn’t even give the green mush a second thought when someone offered it to me. It wasn’t until I was introduced to a classic guacamole recipe that I hesitantly gave a try and instantly fell in love! This recipe had the perfect ratio of avocados mixed with diced red onions. Then came the hint of lemon juice and just a bit of salt. That is all that is needed! You will notice that this guacamole recipe does not include tomatoes, red peppers, hot peppers, cilantro, cumin, etc.. It is a basic, yet delicious recipe that is sure to be a crowd pleasure. If you like to add a little heat to you guac, then by all means, spice it up a little. You can add in diced jalapenos or hot pepper flakes to kick it up a notch. For best results let it sit in the refrigerator for a couple of hours before serving so that the flavors have time to come together and meld. Serve with veggies or tortilla chips. Can also be served as a spread for your favorite sandwich. Classic 4 ingredient Guacamole recipe that is a true crowd pleaser! Cut avocados in half. Dice and place in a medium sized bowl. Add diced red onion, lemon juice, and salt to the bowl. Mash together until desired consistency. Refrigerate for at least 1 hour for best results.